← The End Of The Euro: What’s Austerity Got To Do With It? Now that’s what a growing number of sophisticated investors are saying about today’s banking behemoths, especially JPMorgan Chase, Bank of America, Citigroup, Goldman Sachs, and Morgan Stanley. As Christine Harper reported in Bloomberg, stock in all of these banks is trading at or considerably below book value, while more focused competitors such as Wells Fargo and U.S. Bancorp trade for well above book value. A brief aside: Book value refers to the amount that shareholders have historically invested in a firm, plus profits that have not been paid out to them as dividends. Market value is the amount that investors think the shareholders’ investment is worth today. The ratio of market value to book value is commonly used as a shortcut way to determine how well a company has performed. For three years, various unimportant people like Simon and me, Fed bank presidents Thomas Hoenig and Richard Fisher, Senators Sherrod Brown and Ted Kaufman, and Andy Haldane of the Bank of England have been saying that the big banks should be broken up for policy reasons. Their size and interconnectedness create huge chokepoints of systemic risk; their complexity makes them too big to manage; their importance and power guarantee that they would be rescued in a financial crisis, as they were in 2008–2009; and that guarantee allows them to borrow money more cheaply than their competitors, distorting the competitive market. What’s especially remarkable is that the megabanks’ are performing poorly in spite of their implicit government guarantee, which gives them a competitive advantage. As Edward Kane has pointed out, the fact that the big banks aren’t more profitable than they are implies that, leaving aside their too-big-to-fail subsidy, they are actually less efficient than smaller banks. So, if the banks would be more more broken up, why isn’t that happening? In general, the mechanism that breaks up inefficient conglomerates is the market for corporate control: takeovers. But the megabanks are virtually immune to takeover (except by each other, which would only make the problem worse). For one thing, the banking regulators wouldn’t let a private equity firm take over a systemically important megabank. For another, the banks are already leveraged to the hilt, so you couldn’t issue any new debt to fund a takeover. So to buy JPMorgan, you’d basically have to come up with $150 billion in cash, which isn’t going to happen. So we get the current situation. In Price’s words: “Within the banks are wonderful assets. How long are the boards of directors going to stand by and take no action and let them be pounded? So far there’s no indication that any of these banks or boards of banks is willing to do anything about it.” In other words, CEOs and directors of midsize retail companies have to worry about being taken over by Bain Capital. But Jamie Dimon, Brian Moynihan, and Vikram Pandit have no one to fear. The basic rules of capitalism don’t apply to them. * Thanks to Anat Admati for bringing this anecdote to my attention. Re Moynihan’s comment: Every single business line in the megabanks is standalone — a trading desk is not going to let the IB side deal at mid to support an IB deal. Trading desks are not paid for doing a good turn to the IB side. Neither are the IB guys paid by doing a good turn for the trading desks. The customer will either get to hit the desk’s bid or lift its offer. So the customer, if they have any sense at all, is better off going to the broker market (or seeing what can be done on the exchange) to get the best price. 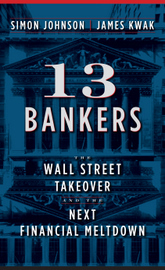 It is a fiction Jamie and Brian, et al, perpetuate to those unfamiliar with how banks work — and how traders and IB folk are comped — that the customer enjoys the economy-of-scale benefits supposedly available from dealing with a megabank. At some point, directors — if they are representing shareholders’ interests — will see various parts of their business can be monetized to provide a greater return to shareholders than is implied by keeping those business lines under the umbrella of the parent company. Then they’ll get to selling them off, or spinning them out to shareholders, who, at the end of the day, actually own all the subs under that umbrella. If not, shareholders will continue to sell off their holdings, continuing to drive values below book. No one pays a premium to have a dollar turned in to 50 cents. Failure of the consolidation of the financial industry reflects the fallacy of “economies of scale” BS that investors have had shoveled our way for years. It’s all part of the scam. When they want to make fees “consolidating” an industry, CNBC tells us how wonderful it will be for all and sundry; shareholders, customers, everyone wins. Then a few years later, the wizards of Wall St., decide that no, there was no “economies of scale” and we should “unlock the value” by taking the conglomerate apart and THAT will enrich the shareholders, keep costs down, blah, blah. It’s all lies and sleight of hand conjurer’s tricks to keep the rubes coming back. The large banks are insolvent, shuttering the operations is the only answer. Maybe George Romero could do a new ZOMBIE movie starring the CEO’s of these banks, with Mel Brooks writing the screenplay, and Mel Gibson as the executive producer. “The crowning achievement of the academics who devised modern free market fundamentalist ideology was the wholesale rejection of empirical observable facts . One of the most extreme permutations of this school of thought, The Austrian School of Economics, even rejects the scientific method. You can’t make this stuff up! It is a real shame that the competitiveness of banks is currently almost exclusively a function of how little capital the regulators require each one of these to have. Till today I have never been invited back to speak on the issue… though other Monday-Morning-Quarterbacks, like Simon Johnson, are sure given a voice. I guess: c´est la vie! Rules of capitalism? They don’t exist. Only in theory with the ridiculous imagining that players operate in goodfaith and in accordance with the socalled ruleoflaw, which is another construct that no longer exists. Define the term fascism and get back to me. We inhabit a fascist state. The evil players are bound by no laws, capitalism, regulatory, constitutional, moral – there effectively are no laws. The predatorclass oligarchs operate above and beyond the law, with their complicit parrots in the socalled governments. It’s jungle law – kill or be killed. In a world where there are no laws – there are no laws for anyone predatorclass biiiiiaatches! Interesting post, James. If they were to hypothetically break up the banks, do you have any thoughts on how the best way to do it would be? I Think Financial Crisis is also take a horrible part in investors because not only American Banks Lowers but ofcourse worldwide economy downgrade. It is really not whether they are big or small, it is whether they are so big that they have to be bailed out by the government each time they fail. I think some form of deposit insurance say on the first $50,000 would be enough to protect most depositors. Then if they fail, the CEOs can come out and explain their huge bonuses while they are in Chapter 11. This is the only way you will be able to stop the banks for taking on sub prime mortgages and investing in derivatives that no one understands. Mike Smith, you are absolutely right. The problem though is that if the bank is too big, and the losses too big, then these will affect the economy and the society negatively, independent from who carries the initial loss. A bad loan is a bad loan… and a loss… who pays for it is an important but a different matter. You seem to be conflating “acquisition by a private equity firm” with “major changes in firm structure and control.” As NewsCorp is currently demonstrating, if a company wants to split up or spin-off assets/operations, it does not need a private equity company (or anyone else) to participate. Obviously, the big banks don’t want to break up, but if in fact many shareholders believe that a spin-off/separation of investment banking from commercial banking would leave them better off, then an activist shareholder (like Bill Ackman’s pershing square) could push for and even accomplish such a transaction. Nor would they need to obtain anything remotely close to a majority of shares to do so, though they would need to get the support from shareholders who collectively hold a majority of shares. In other words, they would need to win an election at an annual meeting (probably involving both a slate of dissident director candidates and one or more resolutions calling for a break up). Bear in mind that under Delaware law, shareholders can file mandatory resolutions via the SEC’s 14 a 8 process, so it is certainly the case that, if a break up had shareholder support, a majority could make a company do it whether or not Jamon Dimon or Bryan Moynihan is on board. I’m not saying it would be easy, just that no one needs to pull together $150B in capital to bring about a market-led break up of a big bank. The only practical answer is to break up the banks via legislation. In the process, the IBs should be spun off to their employees and shareholder funds should not be used to finance their wagering. With IBs own money at stake–as it was until several decades ago–rather than shareholders’ funds, IBs will do a lot less wagering and perhaps, a lot more investing. Such a restriction might also result in the reimergence of regional IBs that can cultivate and help finance smaller regional enterprises in which the large banks have no interest. Breaking up big banks would be a plus, plus for our economy and our democracy. Decide that all resulting banks will need to have 8 percent in equity against any asset from there on. Then create four management teams and have them, in turn, round after round, select 10 billion of assets belonging to Senior Mammoth Bank, until you have four Junior Mammoth banks. Then force all those who hold credits against Senior Mammoth Bank, in excess of 250.000 dollars, to convert whatever percent of these is required to cause each of the four Junior Mammoth banks to have 8 of all assets in equity. And then let the market take price the final cost of the breakup. When we bail out big bank, why not go ahead and wipe out shareholder equity to the extent of the bailout? Yes, but in my mind they will be justly wiped out by extreme dilution. Seriously? You think the equity should not get wiped out if one of these firms has to be bailed out again? Why not? Equity is the riskiest slice of the capital structure. Your 401(k) should not be invested in it if you 1) don’t understand what equity is, 2) don’t know you can lose it all. I’m not saying it shouldn’t be, I’m saying that our gov’t knows we all invested in the FIRE sector stocks even though we personally might not have known what the heck we were doing. Remember, a lot of 401Ks had limited options for investment vehicles and many folks lined up for the “growth” funds…whatever they included. It hurts worse if the ox that is gored is your own. You appear to be intelligent, but you have no idea of what markets are or what they do. Best to stay away from them. @aurelius: Do you always resort to ad hominem attacks when you think someone doesn’t understand the question? Of course equity should be wiped out, and yes, most of the retail investors in the market should never have been there in the first place. But when pensions were replaced by portfolios over the last 30 years, in they came. I’m just noting that “the stockholders” aren’t just some isolated group out there. Alternative solution: They are determined to no longer be banks. They are removed from access to FED discount window and FDIC insurance. Let them buy insurance from the private sector. Guess what would happen to their business then. As to book value, everyone knows it is a deceit in many instances. Try Sino Forest, Enron, WorldCom. for a study on how published book values can be used to fool investors. Cheap shot at Simon earlier their Per Kurowski, after all your able to get your ideas out via commenting here on his blog. That said, your idea about the mechanics of breaking up the TBTF, into mini-mastodons is very good, and an actual proscription for what to do. Oregano brings up a very good point, the public at large, and retail investor, have been steeped in the TBTF arguments permeating the press, and much drummed upon here by Simon, If market perception is that TBTF benefits real or imagined proffer an implicit advantage to the Mega-banks, then owning that stock also transfers that advantage to their investors. In other words, a implicit government subsidy to the TBTF banks, transfers to their shareholders. Who would those shareholders want that removed?. The government has it’s big fat finger on the risk scales of these banks, and shareholders can leverage that to their advantage. That’s why many large companies, not just financial behemoths have been quietly “explaining” to regulators that they too are TBTF. GM turned out to be TBTF, and I bet you 1 trillion Zimbabwe dollars that so is Walmart or Google. Hasn’t the stock-market began to price that in. No criminal law violations here, but only monetary penalty>? pffft. These banks operate as models of organised crime. SPECTRE (SPecial Executive for Counter-intelligence, Terrorism, Revenge and Extortion) comes to mind. A government mainly based on this calibre of ‘economic’ activity is itself nothing more than a purely criminal enterprise. It all goes back to 2005 when Martha Stewart went to jail for obstructing justice. She did nothing wrong but she lied to the detectives who were investigating her sale of Imclone stock. Next we have Standard and Poor rating bundles of sub prime mortgages as AAA when they internally called then sh_t. None of those guys have gone to jail. Now we have Jamie Diamon with rogue traders losing $9 B in derivative exchanges. Not only is he free from jail time, he keeps his director seat on the Federal Reserve. It turns out if you tell the truth about your screwups, they let you go. Bernie Madock would probably be on the street if he had not lied to the SEC investigators about the$40 B he stole from his clients.